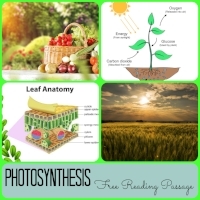 Photosynthesis is the process through which plants make energy for themselves. The amazing thing about photosynthesis is that plants take sunlight and turn it into food. Can you imagine being able to eat sunlight? Plants absorb water through their roots. The water travels up the stem of the plant to get to the leaves. The water travels through the xylem. Xylem is made up of tubes that carry water and minerals from the roots to the leaves of the plant. Carbon dioxide is absorbed through the stomata on the leaves of plants. Stomata means many stoma. A stoma is a small opening on the leaf that lets carbon dioxide in and oxygen out of the plant. The water and carbon dioxide come together in the chloroplasts of the plant cells. Chloroplasts are an organelle, or a part of the plant cell. Fruits and vegetables come from different parts of plants. Inside the chloroplasts, a chemical called chlorophyll absorbs sunlight. The energy from the sunlight is used to break the water molecules into hydrogen and oxygen atoms. The oxygen is released through the leaves for people and animals to breathe. The carbon dioxide and hydrogen come together to form glucose which is also known as sugar. Plants use some of this glucose for energy, and some of the glucose is stored in the form of fruits and roots. Strawberries, pears, and apples are examples of fruits that people eat. Carrots, garlic, and onions are roots that people eat. Glucose can also be stored in stems, leaves, and flowers. Most food chains start with energy from the Sun. Without photosynthesis, people and animals would not be able to live. Energy comes from the Sun as sunlight and feeds the plants. People and animals eat the plants. Even animals who only eat other animals still get their energy from plants because the animals they eat got their energy from plants. This idea is called the food chain. Every food chain (except some rare exceptions deep in the ocean) starts with energy from the Sun.